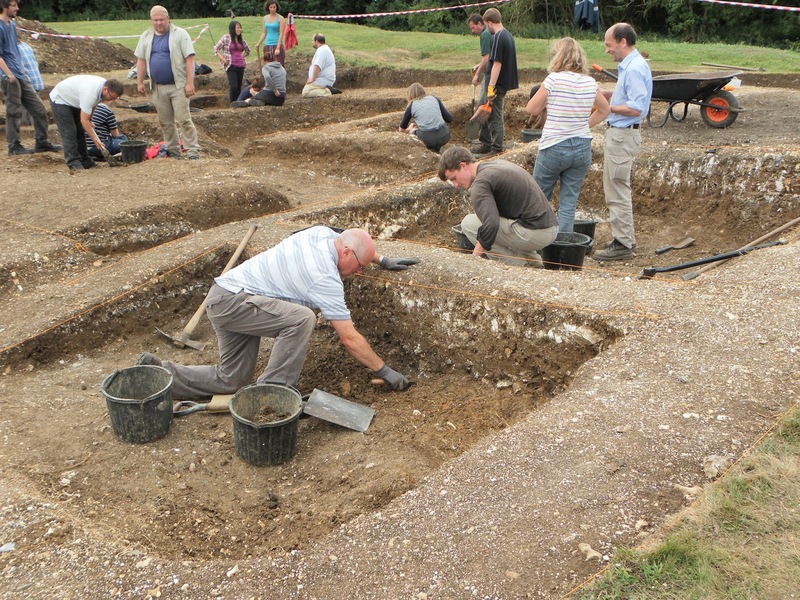 Jamie Ingram dug at Basing House in Summer 2013, as part of a team of undergraduate students. This winter, Jamie wrote an essay inspired by an object found at Basing House. Jamie wrote this essay as part of a module that he was taking entitled: The Social Lives of Objects. Delivered by Dr. Yvonne Marshall, who is also part of the Basing House team, this module aims to look initially at how objects operate in ethnographic and contemporary worlds, then to use this knowledge to better understand how archaeologists might go about interpreting the role of objects in past societies. We think that Jamie’s essay is an excellent example of how this can be achieved. Jamie has very kindly shared his essay with us. In this essay I will analyse a piece of slipware pottery that was excavated during the summer 2013 University of Southampton dig at Basing House. It became obvious at the outset that this object had a strong agency and with further handling and study the mug turned out to have a complex story to tell anyone who had the time to pay attention to it. This story this mug can tell is one of ownership, loss and discovery but also a deeper story of the world it stands for. The mug stands at the centre of an ontological reality and it is through this reality that the object can be examined in both its ability to influence those about it via the primary agency that it carries and as a lens to the past. At times through this essay I refer to the mug as a 17th century slipware mug but as will become obvious this is not the entire truth about this object and it contains much more meaning and many other truths exist within the reality of this object. 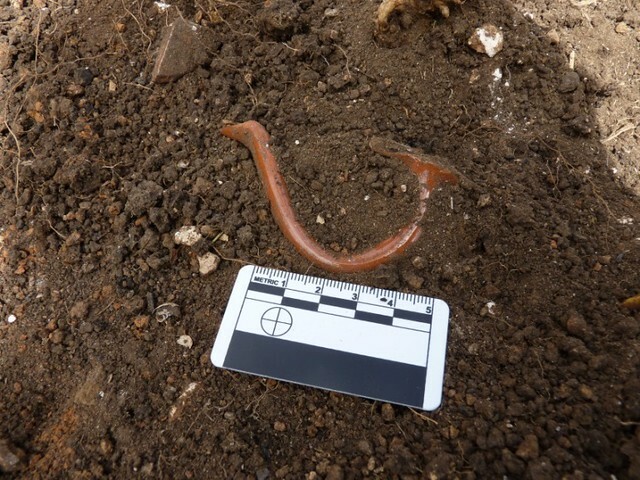 The 17th century mug of interest in this essay is the fragmented remains of a slipware mug that was excavated in late July 2013 at Basing House, a site in Northern Hampshire. The mug is made from a red brown clay and decorated with a pattern created using slip, a watered down clay, that has been coloured to provide cream decoration this has then been glazed inside and out (figure 1) with only the base of the mug remaining undecorated and unglazed. Due to the broken nature of the object it is difficult to state the overall dimensions though I can say that the base would have been approximately 70mm in diameter. The handle, found intact but separated from the rest of the pot was 60mm high with a depth from the pot body of 40mm (Figure 2). The site under excavation had been used as a gun platform during the English civil war and had been previously excavated during the 1960s by the Aldermasten archaeological society. The location has subsequently not been backfilled and had become intensely overgrown by the time the new excavation started. As the clearing of the plant matter and de-turfing took place it became evident that a number of the baulks left by the previous excavation had slumped and it was during the clearance of this slump and partial backfill that the fragments of the pot were revealed. As the fragments started to appear there was a general buzz of excitement about the excavation as it appeared that we were starting to uncover a potentially important piece of material from the site that had been missed by the previous dig. This excitement continued to grow as more and more fragments were uncovered and the level of decoration became more apparent. 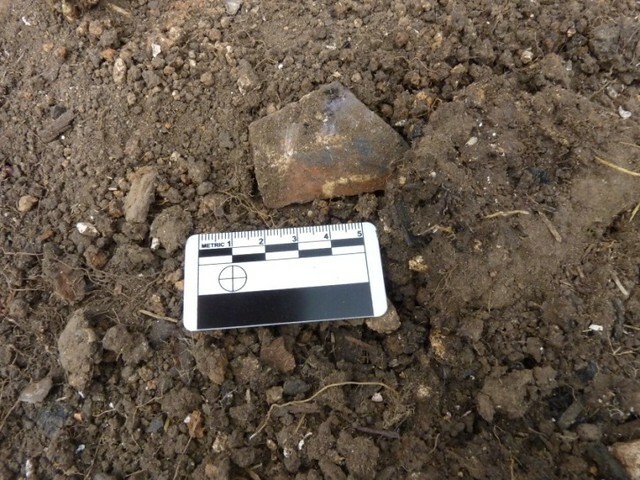 The evidence of burning in the soil close to the object also suggested that there had been localized fire in the vicinity that matched with the charring on the sherds. 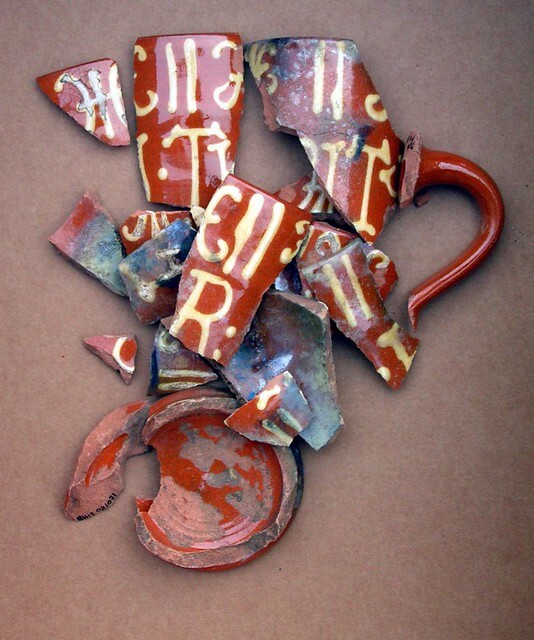 Once the sherds had been cleaned properly and examined it became evident however that the slipware mug was in fact of modern construction (Figure 3 and 4), and bore the mark of a potter, Steve Millingham who make modern pottery objects based on those from the 17th century for re-enactors from the Sealed Knot organization. Mr Millingham was able to inform the excavation that the vessel was probably a mug made in the 1980s or 1990s and most likely bore the motto “Pity the por”(personal communication 04/12/13). Figure 3 – Mug Base Showing Potter’s Mark (Basing House Project, 2013). Within the ontological confines created by the mug it became easy to relate to both the re-enactors and the original soldiers who would have been at this site. The mug had never been made with the intent to deceive but rather was a part of the epistemological construct created by the Sealed Knot in their attempt to interpret the world of the Civil War in the light of the modern consumerist world that they operate within. This world view generates a story of conflict between political ideals based on the interpretation of the beliefs that the king did or did not rule with the blessing of god, where the two sides come to war because the king will not give power to the parliament. I would contest however that this vessel gives us a lens to not only view the epistemological construct of the re-enactors but a chance to view at least in part the two antagonistic ontological states that existed in England at the time of the civil war in much the same way as the material of the modern hunting shrines of the Guatemalan highlands can provide a lens to the ancient realities of the predecessors of the modern Maya descendants (Brown and Emery 2008. P300-337). The world of the re-enactor who owned and used this mug would when on site have, most likely, been one informed by the Sealed Knots interpretation of the siege of Basing House, based on the written history of the events, and the extant remains at the site. The use of objects purchased as ‘replicas’ to aid this demonstration of life and death at a civil war era siege is intended to allow both participants and observers to grasp a better understanding of the epistemological depiction of the world that is being created, it is impossible for the re-enactment to be anything other than a mapping over of knowledge of a past world onto the modern as to do otherwise would be a near impossible act. It is clear from the way in which the excavation team reacted to the recovery of the vessel sherds that it held a level of primary agency that we were completely unready for. The ability of the object to create a level of excitement and enthusiasm with so many people, staff and student alike was truly incredible and can only be linked to the ability of this object to directly influence the world around it and the people inhabiting that world. As the object revealed more of its true self however the world around it changed from one of excitement about finding so much of a seventeenth century object to the intrigue of how a modern vessel in the style of its earlier counterparts had managed to come to rest in such an evocative location and why it had been made. In this way the slipware mug came to represent its unknown owner and the potter in much the same way as the broken green bottle in Janet Hoskins work came to represent the Maria Rihi (Hoskins, J. 1998 p161-163). It also though came to represent an unknown and possibly non-existent slipware mug that could have been present at the siege of Basing House and as such able to give us a level of access to the world of the English Civil War. The object would however have exerted a strong primary agency on the re-enactor giving them access to a past, when equipped with the objects the re-enactor ceases to be the modern person that they are on weekday and becomes a soldier in the new model army, serving parliament and fighting against the injustices meted out by the king and his supporters. This primary agency is akin to the level of agency that can be attributed to objects from an animist culture, and whilst the re-enactor and the team of staff and students involved in the recovery of the object from the Basing House site to not live in a world where animism is widely expressed as a common practice it is never the less possible for objects to have such a strong level of agency when we are paying attention to them and allow them to influence our perception of the world. In addition to the agency that this mug has on the modern world it also possesses a powerful property in that it allows, as a dualistic object to appear to sit within two distinct time frames, granting the archaeologist access to a temporal distance that is not always open to us. It stands for a time when two realities were in direct conflict and I would contest that this time represented by the epistemological construct of the sealed knot is in fact a result of the direct conflict of these two ontologies. On the one hand we have a world which holds at its heart the absolute truth that the king rules as a result of god and that he is in fact an aspect of god present on earth. On the other side we have a world that exists under the benefaction of god where all men and women are created equal and that the king like any other man is equal in the eyes of god and therefor fallible. This particular 17th century slipware mug being in material a creation of the twentieth century holds within it the properties of a theorised mug created during the 17th century. This knowledge held within the mug is what allows us to gain access to the ontological existence of the past and through it we can start to examine the nature of those worlds, the motto ‘pity the por’ would suggest that it was intended to instil or further a belief in Christian charity and that its owner was sympathetic to the ideals that the poor and needy during a period of general hostility and war. The physical presence of such an item on a battlefield tells of the duration of the siege, a marching army would most likely be using metal or wooden drinking vessels, objects that are resilient to damage of easy to replace at minimal cost, this slipware mug is going to be a more expensive item and by the nature of its material open to potential breakage during transport or battle. 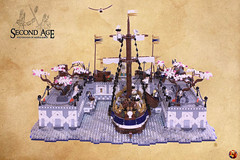 It tells the story of a soldier, stationed on a hillside or in the fortified house for the duration of the siege, a man with some means but who wishes to demonstrate in everyday life wishes to demonstrate an understanding of piety and generosity despite the horrors of civil war that he witnesses. The usual epistemological view of the 17th century is further reinforced by articles such as Diane Purkiss work on witchcraft in the English civil war where she describes it in terms of fantasy, and discusses people looking for people and events to blame for the horror (Purkiss 1997 p.103-132). This treatment of witchcraft and the hunting for it as a combined fantasy of a great many people directly undermines the ontological existence of the 17th century where god is seen as the arbiter of all things good and the evil all things evil and the witch is the embodiment of the devil and his demons on earth. It is therefore completely reasonable for godly people to accept that the witch exists and must be destroyed to counter the horrors they are facing at the time. As I have already discussed this object was not created to deceive and even though at first it did this it was quickly forgiven as it obtained new meaning as the product of a living potter and therefor its story from creation to loss and destruction to archaeological recovery could be told in a complete form. Very few objects can claim such a complete biography within a single human generation and even fewer can express the level of agency that this mug can clearly do. The very nature of the mug and the world in inhabits makes it a special object to hold within the museum service collection and the ability of it to grant access to so many stories could make it a valuable tool for opening the way for many more people to understand the worlds of the past and particularly the civil war as it raged around Basing House. In conclusion the 17th century slipware mug in question is a deeply complex object with primary agency in both the modern world and the world of the re-enactors. This agency is enacted in different ways in these two closely liked worlds but is always present and allows access to the past through its existence. What makes this mug unusual is its ability to deceive without trying, the ability of it to appear to occupy both the modern world and the world of the English Civil War. 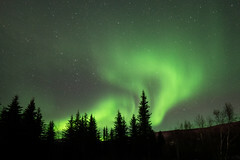 This ability is a function of the world the mug occupies, being distinct from the world that we are used to living in it functions as a mental bridge between the 21st and the 17th century. This ability to create a unique ontological space makes it a valuable, confusing and sometimes infuriating object that can if treated with appropriate respect open the eyes of anyone who works with it. 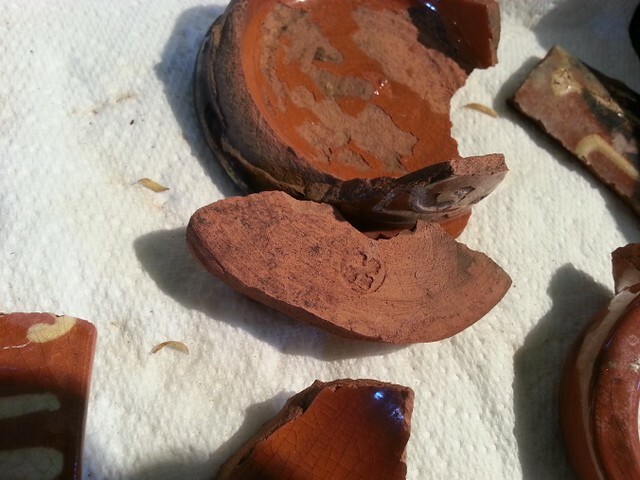 I would like to thank Nicole Beale, co-director of the Basing House excavation 2013 and David Allen from Hampshire Museums Service for their assistance in providing access to the communications with the potter who produced the vessel and images of it in sherd state following its cleaning and return to the museum service store. Hoskins, Janet. (1998) Green bottles and green death. Biographical objects: How things tell the stories of peoples lives P. 161-181. 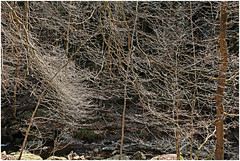 Routledge, New York. Personal communication 04/12/13 email conversation with Beale, Nicole regarding the origins and manufacture of the slipware mug.